Guitarbitz has just had a delivery of new strings by Elixir. take a look at http://www.guitarbitz.com/guitar_strings.htm. 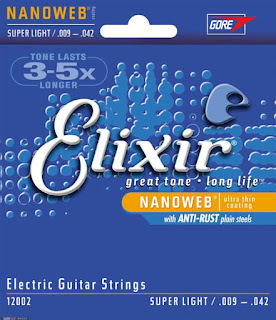 Elixir Guitar Strings last 3-5 times longer than ordinary strings without compromising tone. This means you buy fewer sets of strings, change them less often, and trust that your guitar is ready to go when you are. The coating prevents contamination and corrosion from collecting in the windings of the strings. Anti-Rust plating on plain steel strings resist tone-deadening corrosion. From £9.95 with FREE delivery to the UK.